Since I became a runner, finding the perfect caloric intake has been hard. Some days, I’m as hungry as Pac-Man, while others, I find myself grazing on a few snacks here and there, completely content. I mean, this isn’t necessarily a bad thing. I was fat for so long for a number of reasons, and one of the main ones is because I love to eat. I love food. More than almost anything else. I love tasty things. I love fruit, and I love sugar. I love savory treats, and I love ooey-gooey, decadent meals. I love hunks of meat on my plate, and I love colorful salads. I love protein bars in new flavors, and I love the smell of a freshly opened back of Funyuns. I love food so much. So much. And that’s why I run. A lot. I’m not quite that bad. I’m more along the lines of this panel from that comic. 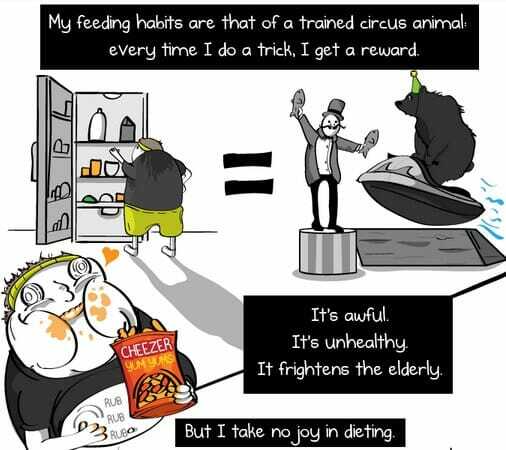 I’m the trained circus animal who gets a treat whenever he does a trick. I may not be eating Cheezer YumYums after a run, but like Inman, I take no joy in dieting. Because dieting doesn’t work. Dieting only sets you up for disappointment and failure. I make sure that I run enough that I can eat damn well whatever I want whenever I want. That means I’m always hungry. I eat at 6 am, 10am, 12pm, 2pm, and 6pm. Every day. Sometimes I get even more snacks in between those, too. Because I am always hungry. Running ramps up my metabolism so much that unless I keep food in my belly at all times, I am cranky and pretty much impossible to be around. And the great thing is that I love to eat. So that’s awesome. I don’t have to eat tasteless garbage like Soylent. I don’t have to force myself to chug protein shake after protein shake just to fill out my macros. I get to eat fruit and Graze snacks and wild salmon sandwiches and peanut butter on sourdough and hamburgers and pretzel crust pizzas and sweet potato numminess and piles of eggs and Quest bars and Builder bars and anything else I damn well please. Because I like it. Because I earned it. I am not eating to fill some emotional gap. I am not eating because food can’t disappoint me. I am not eating because I have nothing else in my life. I am not eating because I have to because some diet plan told me to. I am eating because I’m hungry. Because I am literally fueling myself. Because I legitimately love to eat. And because I love to eat (and I need to eat because I need nutrients and such to fuel my body), I get to fully enjoy myself by eating pretty much anything that I enjoy–and because I enjoy pretty much everything, being a runner has made this former fat guy’s life pretty much awesome. Now, as much as I love to eat, it can be a slippery slope to run just to eat. It can be unhealthy. It can lead to eating disorders and binges. It can lead to an unhealthy obsession with caloric intake, and it can lead to a skewed view of food and calories and pleasure/pain responses. I do still look at a donut and think “I’d have to run three miles to burn that off.” But that’s okay. Because I’ll be running those three miles anyway. I am not eating and then trying to up the amount I run to account for it–I used to, and it sucked. But after three years of being a runner and two years at my goal weight, I think I’ve finally pushed through that mess. It was hard, and I won’t deny it. Now, I just run. I run as much as I want to. And I eat when I’m hungry. I don’t so much worry about the weight loss aspect of it. I don’t worry about a +/- few pounds any more. Since I switched my mindset out of maintenance mode, my weight hasn’t fluctuated as much. Because I don’t run because I eat. I eat because I run. 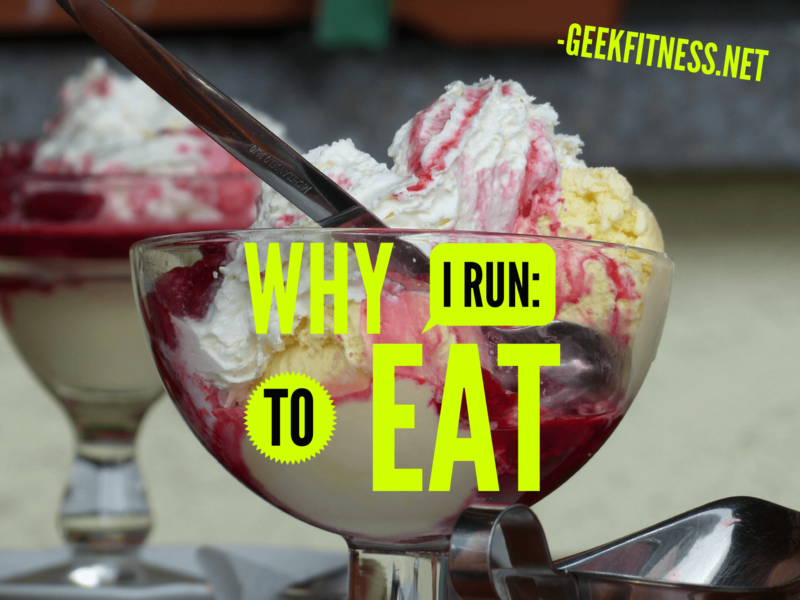 Tell Me, FitGeeks, Why Do You Run? Running isn’t for everyone. I found I loved it after a long time, but wasn’t sure if I’d ever get there. I do think fitness is all about what you like and can keep you moving. Oh, Ashley, that’s too bad! But if you’re up and moving around, that counts for a lot. I have gone through a couple of injury cycles myself over the past few years, and I know finding other ways to stay moving has kept me sane, even when I am on my feet all day at work, too (teacher). learning to know when your body is truly hungry and feeding it the nutrients it needs is key for sure. All this working out does make me hungry all the time too.